As Agents for Thersa A. Cruse, Executrix for the Estate of James A. Demint & Betty A. Demint, RCPC Case No. 2013-E-257 & 2013-E-286. 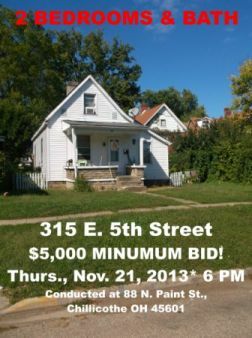 Thurs., Nov. 21, 2013 * 6:00 PM * 6 Auctions conducted at the Office of Stanley & Son, Inc., 88 N. Paint Street, Chillicothe, Ohio 45601. 315 E. 5th Street, Chillicothe, Ohio 45601 $5,000 Minimum Bid! Being a 2 bedroom & Bath home.